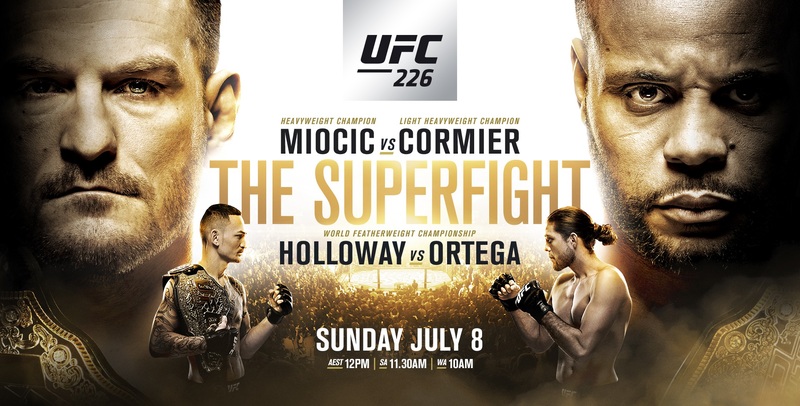 The super fight between Stipe Miocic vs. Daniel Cormier will headline UFC 226 on Saturday 7th July at the T-Mobile Arena in Paradise, Nevada. Stipe Miocic (18-2) broke the UFC record for title defenses in the heavyweight division when he defeated Francis Ngannou at UFC 220. Miocic used his wrestling skills to dominate the powerful knockout artist and defended his title for a record-breaking third time. The Strong Style representative will have his hands full for his fourth title defense when he takes on UFC light heavyweight champion Daniel Cormier. The champion will be facing the most decorated wrestler that he has ever fought in the Octagon when he meets the Olympic wrestler in this super fight. The former NCAA Division 1 wrestler has been preparing for Cormier by training with former UFC heavyweight champion Mark Coleman and current Bellator light heavyweight champion Ryan Bader. Daniel Cormier (21-1-1 NC) has the chance to join Conor McGregor in the UFC history books to become only the second man to hold two titles in different weight classes at the same time. Cormier is no stranger to fighting at heavyweight and is currently undefeated in the division with 13 wins. Cormier entered the Strikeforce Heavyweight Grand Prix in a reserve bout and defeated Jeff Monson in 2011. The AKA team captain followed up that year by brutally knocking out Antonio “Big Foot” Silva in the Strikeforce Heavyweight Grand Prix semi-final. Cormier defeated former UFC heavyweight champion, Josh Barnett via unanimous decision to become the Strikeforce Grand Prix champion in 2012. The AKA representative holds wins over Frank Mir and Roy Nelson in the UFC heavyweight division. UFC featherweight champion Max “Blessed” Holloway will defend his title against the undefeated Brian Ortega in the co-main event. Holloway (19-3) stopped Jose Aldo in the third round at UFC 212 to capture the UFC featherweight title. The champion made his first successful defense against Aldo in a rematch at UFC 218, where he stopped the Brazilian again in the third round. Holloway was later forced out of a scheduled title defense against Frankie Edgar at UFC 222 due to a leg injury. Brian “T-City” Ortega (14-0-1 NC) scored the biggest win of his career when he stepped up as a late replacement against Frankie Edgar at UFC 222. Ortega knocked out the former UFC lightweight champion in the first round, becoming the first man to stop Edgar in his professional career. T-City picked up Performance of the Night and $50,000 of bonus money for his performance against Edgar. Ortega is a Brazilian Jiu-Jitsu black belt under Rener Gracie at the Gracie Jiu-Jitsu Academy in California. Light Heavyweight: Gökhan Saki vs. Khalil Rountree Jr.